What a great story this is! 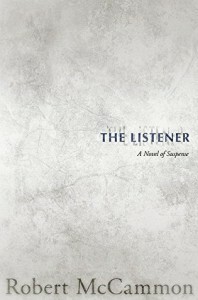 Set in the American south during the Great Depression, The Listener is a unique tale. Starting with a man we'll call Pearly and ending with the opening of a free clinic, Robert McCammon sucked me in as he always does and now I have another book to add to my All Time Favorites shelf! I wasn't sure for the longest time where this story was going. But when Pearly meets Ginger LaFrance, and joins her cold quest for riches, I knew I was in for the long haul. Not since the book MINE, has Robert McCammon created such a cunning female villain. Crafty and OH SO cold, Ginger is capable of anything. When she concocts her evil plan with Pearly as her back up, you just know it's not going to go well. And when another of her family members joins their crew, you cannot help but feel that it was a mistake on Ginger's part. You also hope that Ginger doesn't succeed. At a certain point in The Listener, you just have to hold on for dear life because this tale races to the denouement and you HAVE to know what happens. I recommend shutting yourself in a room for the last 50 pages so you can read it without being bothered. Trust me on this! You will be rewarded with an ending so poignant, yet so perfect and totally satisfying that you might find yourself with a tear in your eye. Not saying that happened to me, (it TOTALLY happened to me), but you know, prepare yourself. Perfection in an ending is so rare, but I think McCammon achieved it here. The only bad thing about getting an ARC, (and in this case it's a REAL ARC, that I can hold and hug tight to my chest, not that I did that), is that there isn't anyone to talk to about this story. I can't wait for you to read it so we can talk about Curtis and Pearly and good old Nilla. In February when it's released, I hope you will remember my words here today and hop on the opportunity to read The Listener. Please come and share your thoughts with me when you're done. I hope that Curtis invades your mind space as he has invaded mine, and we can talk about how much we both love him. Or perhaps we can talk about THAT character that was such a memorable part of another GREAT, (maybe the best?) Robert McCammon book, and how much we loved seeing them again? I sure do hope that we can, my fellow readers. I sure do hope we can. The Listener has earned my highest recommendation!